It is fairly well accepted that Sihtric, Hiberno-Norse King of Dublin was the first to mint coins in his own name in Ireland. To date, all 7 phases of Hiberno-Norse coin production in Ireland have been attributed to Dublin rulers. But, who brought the first coins into Ireland and for what purpose ? Who Brought the First Coins into Ireland and Why? Roman coins have been found in Ireland – some at pre-Christian religious sites, some at trading places, and others at Roman-style burial sites. It is, however, a much debated issue as to whether or not these coins were used as a currency at this time. Thus far, the position of Irish archaeologists is that Roman coins were not used in transactions, i.e. a de facto currency. It is generally accepted that the native Irish used a bartering system – however cumbersome and difficult this may have been. The native Irish system must have been extremely difficult – unless every small place was self-sufficient and they used a communal, ‘shared labour and goods’ system. How did a native Irishman buy a cow and how did he pay for it? How did he pay for a single meal? How did he pay for a weapon or some tools? At the high end of the scale, the Irish kings (or chieftains) simply got paid large sums by extortion, i.e. it they got paid, they didn’t raid. How did the king pay his soldiers? How did he (or they) pay for their food? This is possibly why coins were introduced into Ireland, i.e. they would have been less valuable than (say) a sword, an axe, or a plough. Stepping back from this conundrum, let us begin by asking how and why, and by whom was coinage introduced to Ireland in the first instance? According to Michael Dolley, “The nature of the economy in tenth-century Ireland varied from region to region, and developed during the course of the century. There is a range of hoard compositions, from ones containing only whole silver ornaments, or whole ornaments, ingots and hack-silver, or a mixture of such silver and coins, to hoards containing only coins”. Dolley goes on to say “In Dublin and its close hinterland the five recorded hoards from the second half of the tenth century contained just coins, and those all Anglo-Saxon. It seems as if a de facto coin economy developed there, albeit one based on imported coins which were probably valued according to their intrinsic silver content with perhaps some premium. Silver bullion may also have been used for certain transactions, as hacksilver and weights were plentiful in the Dublin excavations, if often difficult to date. Yet coins must have been prized more highly for they were hoarded separately and, we may suppose, preferred for some purposes or by certain groups in society”. Apart from the same problems I have with Parsons’ conclusions, I also have the following reservations about Woods’ line of inquiry, i.e. Coins minted by the Hiberno-Norse in Cork, Limerick, Waterford and Wexford are (to date) unknown. However, just because we haven’t found any, doesn’t mean that they never existed. It will take just one find to change our opinions about the (lack of) numismatic history of Cork, Limerick, Waterford and Wexford. Gerreits and Kenny question the assumption that the Irish did not use coinage – even after Dublin began minting its own coinage. 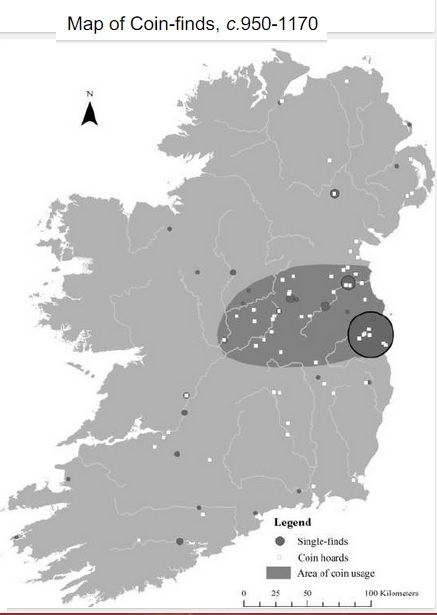 Kenny suggests that contact with the Hiberno-Norse may have created a “heightened awareness of coins and coin usage,” especially in the kingdoms bordering Dublin—Mide, Brega, and north Leinster. Most academics still assume that, in most cases, Dublin or another of the Scandinavian port towns, was the point of entry or production of the coins, which then passed into Irish hands through trade, or as tribute or booty. It is worth noting that, even outside of Ireland coins were used at this date only for a restricted range of functions, such as major trading transactions, payment of taxes or tribute, or payment for military service. Despite the fact that he also ruled Waterford (at times), Sihtric does not appear to have minted coins in Waterford during his troubled intermittent reign. Most Viking-age coin hoards, however, occur in areas that would have been under Irish, rather than Scandinavian, control—notably the powerful midland kingdom of Mide (Meath). Analysis of the occurrence and distribution of these hoards suggests that most were deposited by Irish, rather than Hiberno-Norse, hoarders. The high rate of hoarding amongst the native Irish suggests they did not use coinage in every day transactions. Given that the Dublin Vikings first used Anglo-Saxon coins before minting their own, would it not be likely that the native Irish would have used Anglo-Saxon or Hiberno-Norse coinage before they too minted their own? If so, would it not be more likely that the native Irish of Mide (Meath) are the ‘most likely’ group to have thought about minting their own coinage? Another consideration, from a native Irish ‘economic’ perspective, is that the monks in the monasteries are likely to have had links with monasteries throughout Anglo-Saxon England, therefore these Anglo-Saxon finds may not have been hoarded by the native Irish per se. The fact that both the Vikings and the native Irish princes raided these monasteries would also call into question the fact that many people label these monasteries as being “native Irish” whereas they did function quite independently of native Irish society, economics and politics. With their links to the Anglo-Saxon Church, plus its Anglo-Saxon styled ecclesiastical art and treasures, is it not feasible that Irish monks hoarded Anglo-Saxon coins and these were, in turn, stolen and hoarded by the native Irish and the resident Vikings? In fact, many Irish monasteries were raided more frequently by the native Irish than by the Vikings. This was because they were ‘perceived’ as great stores of wealth. Clues to the answer of the above questions can be found in hoards thought to have been deposited in the late 10th C in and around Dublin. The benefit of a controlled, science-based excavation is that of context, i.e. documenting the relationship of the various finds for each chronologically-dated layer. Thus we know approximate dates of deposition for each find. In Dublin, it is now known that the majority of the coins found each hoard found closely correlate to the type of coins we would expect to find for that date range, i.e. 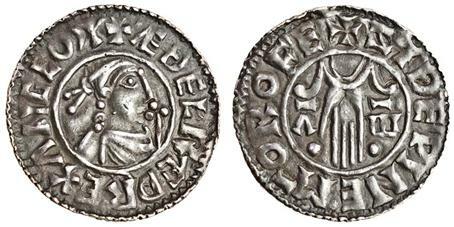 the Anglo-Saxon kings changed the design of their coins at regular intervals. Once Sihtric began his ‘great experiment’ of minting his own coins, the proportion of Anglo-Saxon coins shrinks to almost zero. why did the other Norse kingdoms not follow suit ? why have we not found Hiberno-Norse coins from in Cork, Limerick, Waterford and Wexford ? We are now left with two scenarios whereby coins were brought into Ireland, i.e. were they brought in by Viking traders or by other traders ? What is obvious is that the Hiberno-Norse vikings seem to be the only people in Ireland willing to accept them. The great traders (and raiders) of the time were the Vikings and Islamic coins seem to have come to Ireland from what is modern day Iraq via Scandinavia. The Vikings also traded (and raided) in France, Germany and all across northern Europe, so it is most likely that the Frankish and Germanic coins came to Ireland via Viking traders as well. Although Andy Woods has pointed out that most of the hoards found to date have been found in native Irish lands, it was the Hiberno-Norse that first began to mint their own coins in Ireland. Maybe these native rulers buried their coins to put them ‘beyond the use’ of the Vikings, or maybe they had no use for these coins themselves. Therefore, we must conclude that it was the Hiberno-Norse that first brought foreign (mostly Anglo-Saxon) coins into Ireland and used them first as an internationally traded currency, and then (later) as a local currency.